One of the best things about attending the Oxford Symposium on Food and Cookery is the chance to meet people with all sorts of interesting food-related jobs. Two years ago I met Marc Meltonville, who runs all of the kitchens in Britain’s Historic Palaces. These are historic buildings that are owned by the Crown but are no longer used as residences by the royal family. They include: The Tower of London, Hampton Court Palace, the Banqueting House, Kensington Palace and Kew Palace. This year, I had a little extra time in London after the Oxford Symposium and Marc kindly showed me and some friends around the restored Tudor kitchens at Hampton Court, favorite home of King Henry VIII (1491-1547). These kitchens are the largest Tudor kitchens in the UK, occupying 55 of the palace’s 1000-plus rooms and covering 3,000 square feet. When the palace was in use as a royal residence there were about 600 courtiers who were entitled to two meals a day provided by the palace. So this was a huge cooking operation, much bigger even than most modern hotels and restaurants. We have the palace provisioning lists from the reign of Elizabeth I (1533-1603) which tell us that during the course of one year 1,240 oxen, 8,200 sheep, 2,330 deer, 760 calves, 1,870 pigs, and 53 wild boar were cooked at Hampton Court. Marc and his crew have done a masterful job outfitting the kitchens as they would have been in the 16th Century. They decided that process was the key so they began with the recipes of the time and decided what implements were needed to make them. Once they had a list, they went out and found artisans who could make replicas using the techniques of the time. 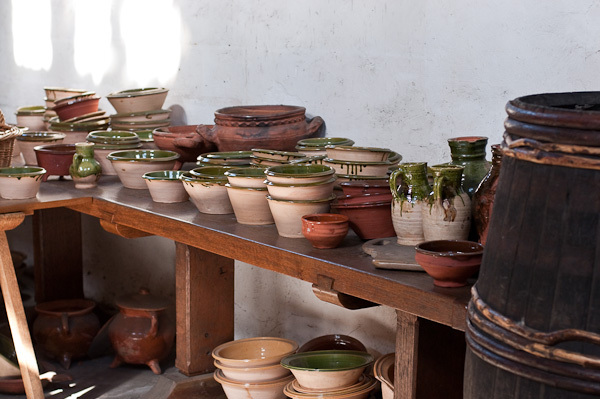 For example, the ceramic bowls are all made locally by a potter who through extensive historical research has determined that for a 16th Century potter to make enough money to feed his family, he had to be able to make one bowl in about three minutes. So he makes each of the bowls for Hampton Court in one throw. When a bowl breaks, the staff keeps the pieces and makes a note of how old it was and what caused the accident. In future they hope to compare their broken pottery with real 16th Century shards from archeological digs to see if it has broken in the same way. 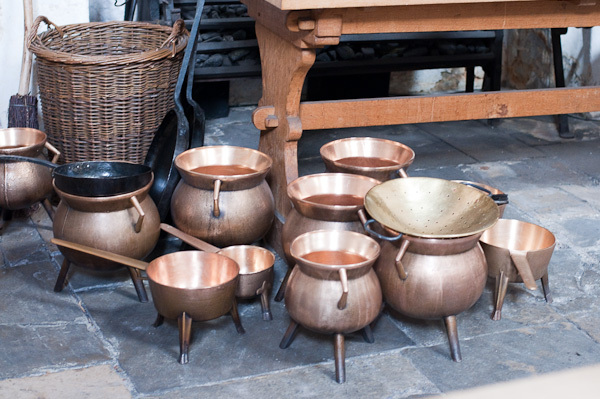 The pots are bronze (tin-lined copper was not used for cooking until the late 17th Century) and the skillets are hammered or wrought iron, not cast iron which is also 17th Century innovation. The wooden bowls used in the kitchen are turned on a pole lathe which is operated with a foot treadle. They are made in “nests,” multiple bowls coming from one large piece of wood and fitting one inside the other when completed. 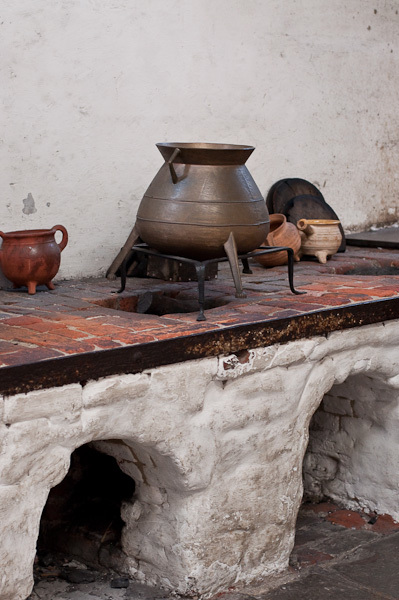 All this research was not just done so the place would look good, Marc and his team fire up the charcoal stoves and actually cook in these kitchens on a regular basis, experimenting with recipes of King Henry’s time. Unfortunately, due to health and safety regulations, they are not allowed to serve the results to the public. For example, when cooking in bronze pots it is important not to allow the food to cool in the cooking vessel which could cause copper poisoning (bronze is an alloy of copper and tin). If you’d really like to sample some of their work you can find a few authentic dishes served in the modern cafe at the palace. Meat Roasting Fireplace at Hampton Court. Can you see the little bench where the spit boy sits? One of the most impressive parts of the kitchens is the meat roasting fireplaces which are large enough for an adult stand up inside. Through experimentation the cooks at Hampton Court have learned a lot about how to spit roast meat. 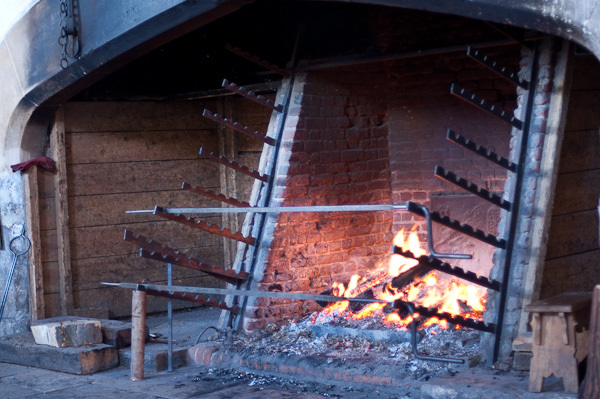 The spits are mounted on a huge rack that slants in front of the fireplace allowing the spit boy to move the spit closer or further form the fire depending on the temperature. Spit roasted chicken is far tastier than what you get baking in a modern oven. As they slowly turn in front of the fire, the chickens constantly baste themselves. Serving roasted meat was also a way for wealthy kings to demonstrate their power to visiting political guests. It costs a lot more money to roast meat than boiling or frying because most of the energy created by the burning wood is lost, going right up the chimney. It is estimated that six to eight tons of seasoned oak was burned in the kitchen fireplaces each day during King Henry’s time. I’ll end with a couple of terrific videos made by the kitchen team at Hampton Court. The first shows how to cook using a charcoal stove, including how a 16th Century cook would start the fire (hint, they didn’t have matches). The second video is all about spit roasting meat. Enjoy!